Note that the voltage across each capacitor will be inversely proportional to the capacitance, with the total voltage being shared out between the capacitors, the smallest capacitance having the largest voltage across it and the largest capacitance having the smallest voltage etc. Capacitors all charge to the same voltage. Note that when using these formulae the values must be put into the formula in their BASIC UNITS i.e. FARADS (not µF) Coulombs (not µC) and VOLTS (not mV). Briefly 47nF; (nanoFarads) is entered as; 15 EXP -09 and 25mC (milliCoulombs) is entered as; 25 EXP -03 etc. This is easiest to do using a scientific calculator. Series and Parallel Circuit Examples. Want some help with electronics math? 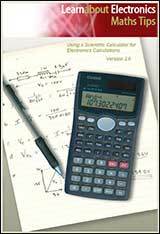 Download our helpful booklet with tips for buying and using a scientific calculator and for sorting out all those electronics values. Invaluable help for the electronics math in this module!